We are the leading supplier of jute sling bag. Can be customized. Sling Jute bags is made of natural Jute fabric. This kudi work sling bag has some kudi work embellishment. Company Name Indarsen Shamlal Pvt. Ltd. 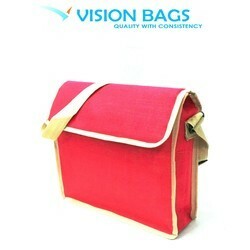 Reckoned as one of the emergent companies of the industry, we are extremely immersed in providing Jute Side Sling Bag. Elegant, formal, rich turmeric yellow juco sling bag with a nice subtle mix of maroon suits all formal and festive occassions. We are counted amongst the top companies involved in offering an extensive range of Jute Side Sling Bag. 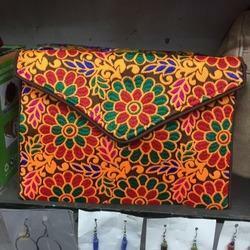 These bags are used by ladies, girls for shopping, taking to college or school, etc. They are made up high quality material. Our all products are quality checked and are authenticated as per the international standards. Description - These lovely pieces of artwork showcase culmination of high imagination. Accessorized with zipper pocket & fetching patterns, these bags are undoubtedly class apart. We have been counted as major firm offering high quality Stylish Jute Sling Bag.